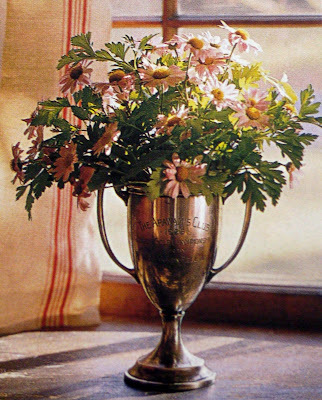 I have some lovely pictures to show you today from an old issue of Country Home magazine, a la' August 2000, I miss Country Home - it was by far my favorite magazine. Naughty me, I swiped it from my mom's stash over the holidays in order to take a couple pictures of a few pages that caught my eye. DON'T Worry, mom's coming over today and I'll return the magazine to me - grudgingly! Sorry the photos aren't the best. I love this room. All the white and red accents. The creaming white walls. The layed back furniture. Oh, and the faded sign over the fireplace - love it! Did you notice the pillow on the couch! How adorable - American flags and pom-pom fringe, a perfect combo. My red loving, chipped paint infatuated heart is SWOONING over this simple fabulous bucket. Where can I get my hands on a bucket like that! This photo jumped out at me also. Love the black stools, the wide plank floor and of course the signs. Ah! the signs. I've got to figure out how to make my own since I have no luck finding this sort of thing on my trips to the antique store. I thought this arrangement was stunning in an old trophy. Guess what item has been added to my "must have" list - - I bet you guessed an old trophy with graceful handles. Man! you ladies are good. Anyone else as infatuated as I am? Thank you for coming to see my treasures! Love the new header picture, very pretty!